Reproduction American Colours in the Great Hall at the Royal Hospital Chelsea. The buildings of the Royal Hospital was designed by Sir Christopher Wren and incorporate a complex of beautiful buildings originally designed to house 412 veterans and their officers. The grounds include the Light Horse Court, Figure Court and College Court and a large park. Within the central building and nearby to the Chapel is the Great Hall, which currently serves as the Dining Room, but was also the site of the 1809 Court of Inquiry of the Convention of Cintra and where the Duke of Wellington lay in state in 1852. Barry, F.W. 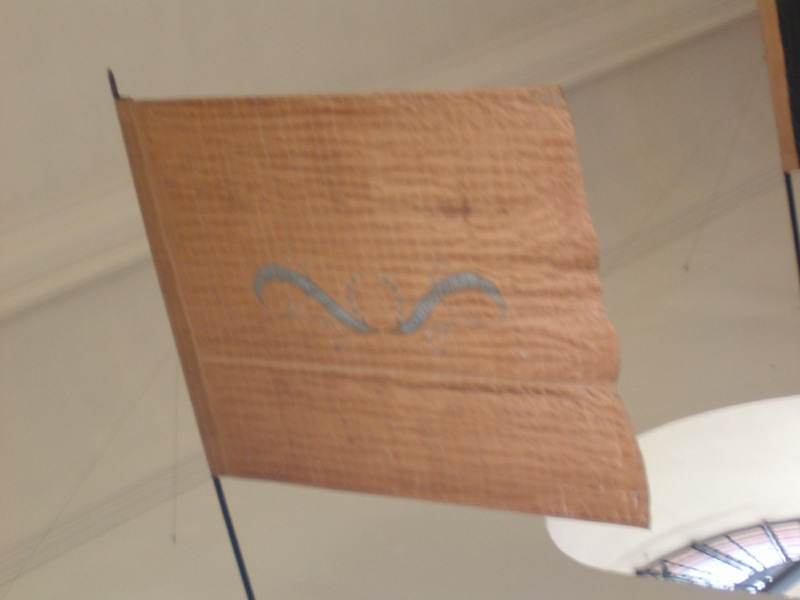 “Captured Flags in the Royal Hospital, Chelsea.” Journal of the Society for Army Historical Research Vol VII, (1928), p. 110 – 117. Malcomson, Robert. 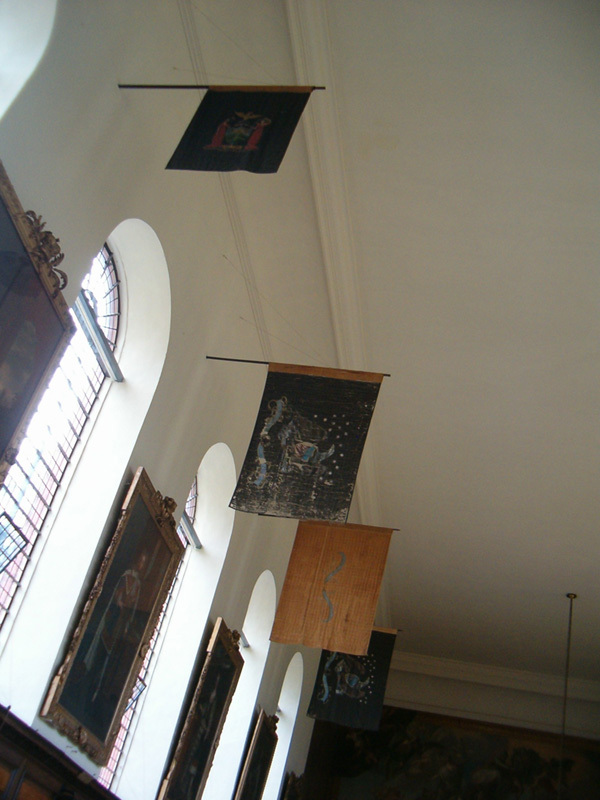 “War of 1812 Flags at the Royal Hospital, Chelsea,” Military Collector & Historian, Vol 58, No. 2 (Summer 2006), p. 58 – 65. All photographs are from the author's collection. Entrance: Two panels greet the visitor at the entranceway to the Great Hall. Each indicates the origin of the colours along each wall. 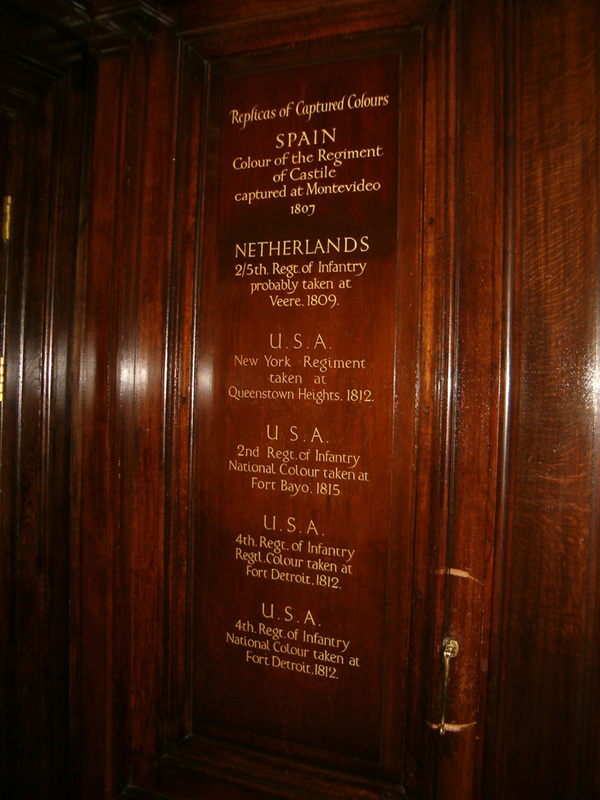 This panel shows colours from Spain, the Netherlands and the four of the colours taken during the War of 1812 (Author’s collection).